If a surprise storm hits the area while school is in session, we may decide to close school early, cancel an event, or both. Mount Calvary Christian School will usually do whatever the Elizabethtown School District does. The school will notify all of the bus companies that provide bussing to/from MCCS. 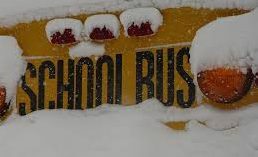 If you indicated that your child should ride the bus home for an early dismissal, he/she will be put on the bus. If you live in another school district, you are free to follow what they do, even if Mount Calvary does not cancel school and is still in session. Parents always have the option of keeping their children at home or picking them up early from school when, in their judgment, the weather and/or road conditions dictate. The school’s automated texting system will give you a notification. Please enroll using the instructions below. MCCS uses Remind.com to notify parents by texting in case of an emergency. You can enroll in our emergency notification system by texting @mccso to the following cell number: 81010. You will receive an immediate confirmation notification that you must confirm. Follow the simple instructions. Elementary teachers (K3-5th) will attempt to reach each of their student’s families using the emergency phone contact that you have provided. Announcements will be made by radio and television. You may tune to WDAC-94.5 FM, WJTL-90.3 FM, WGAL Channel 8, WHP Channel 21, WHTM Channel 27, and Fox 43. All students will be escorted by their teachers to the gymnasium or sanctuary to await pick-up by either the bus companies or by one of the persons authorized to pick them up. Your child will only be allowed to leave the school with a parent or with one of the individuals that you listed as an authorized pick-up person. Student drivers with a car at school will be dismissed to immediately leave MCCS with their siblings. Those students that have cell phones will be given permission to contact their parents. We ask that parents do not call or text your child’s cell phone. When the administration is finished giving instructions to the students, those with cell phones will be told to call their parents at that time.